Haruyo Takamasu is a translator. Born and raised in Kawagoe City, Japan, she now lives in Tsukuba City, Japan. She obtained her bachelor's degree and master's degree in American literature from Japan Women's University. She has translated the following books: World Tank Museum and Kingdom Hearts Trading Card Game, both published in the United States, as well as DECの興亡 (DEC no Kobo), published in Japan. She frequently translates articles and papers about business, psychology, and entertainment. 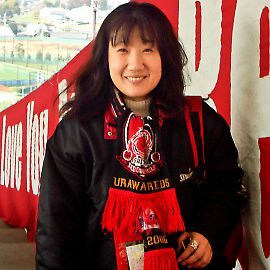 A big soccer fan, she supports the Urawa Red Diamonds, the 2007 Asian Champions. Her favorite kanji is 愛 (あい) because it means "love."